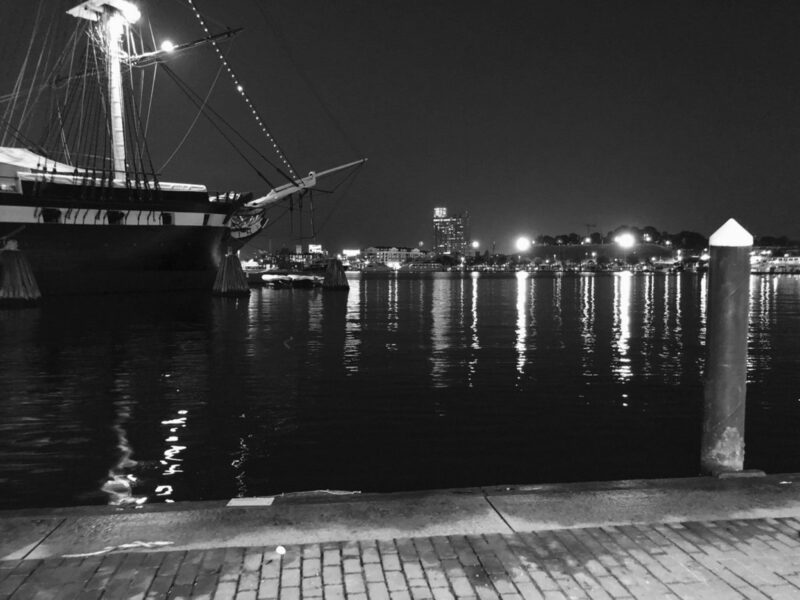 Edgar Allan Poe called several different places home, but none of them quite seem as true as Baltimore. It was in Baltimore that Poe's great-grandfather set up his home in 1755, and it was in Baltimore that Poe met his wife. He also published a great deal of poetry here, his entire second volume, in 1829, and of course, the place he died. 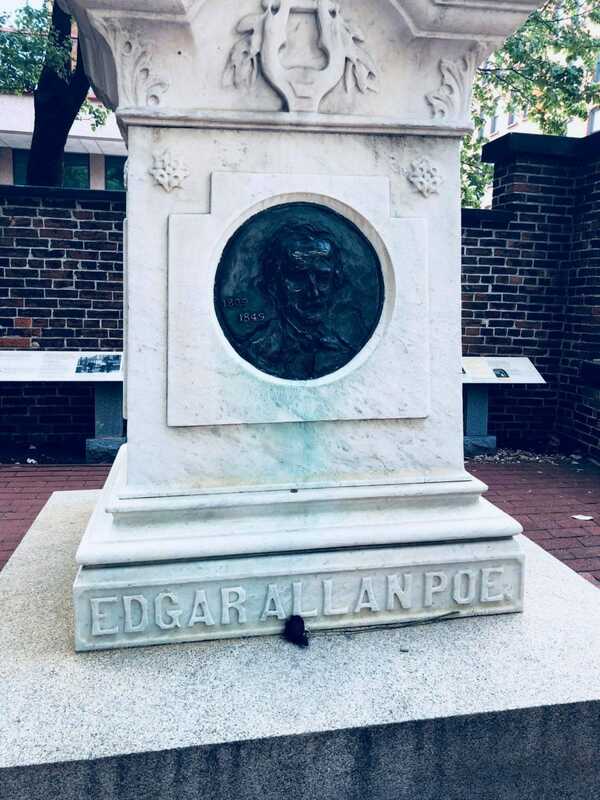 To get a good grasp on Poe's life in Baltimore, and his life in general, head to these 10 spots and walk in Edgar Allan Poe's footsteps! The Edgar Allan Poe House is one of the most educationally and historically insightful places you can visit while in town! Literature lovers in your group will seriously geek out during a tour at this house, everything inside screaming classic literature, dark tales, and Poe-like aesthetic. This house was built around 1830 for a well-known local man, Charles Klassen. He moved out in just a few short years and the house became the residence of Maria Clemm, whose mother was Elizabeth Poe. Maria's daughter was Virginia Clemm, the future wife of her nephew, Edgar Allan Poe. The family, along with Maria's son Henry Clemm (not to be confused with Edgar's brother Henry Clemm), lived here from 1833 to 1835. At the Westminster Burying Ground, you will find both the original grave site and the newer, more substantial one. 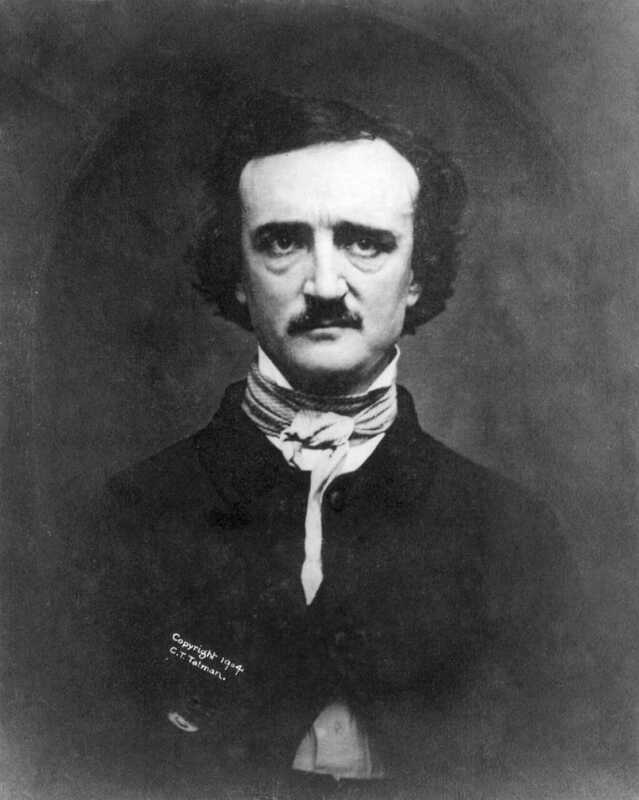 Edgar Allan Poe was first buried in 1849 in an unmarked grave. Shortly after a sandstone tomb with the number '80' was placed on it, then a better, marble display was created for the area but destroyed by a train before it was installed. Today you will see the monument and headstone from 1875. The monument features a bas-relief bust of Poe and the dates 1809-1849. The other sides pay tribute to Maria Poe Clemm (Virginia's mother), and Virginia Clemm Poe. The Church Home and Hospital, in Poe's time known as the Washington University Hospital of Baltimore, was the spot Poe passed away, though the conditions of his passing are definitely up for debate. The last man known to have treated Poe is Dr. Moran, whose accounts are now considered unreliable due to the frequently changing nature of them. It is widely believed that he died of the drink, though the only official statement made was by the Baltimore Clipper in 1849 (Poe died October 7th, a Sunday, at 5 am that year) that said Poe died of 'congestion of the brain'. Dreaming Dreams; No Mortal; Ever Dared; To Dream Before”. 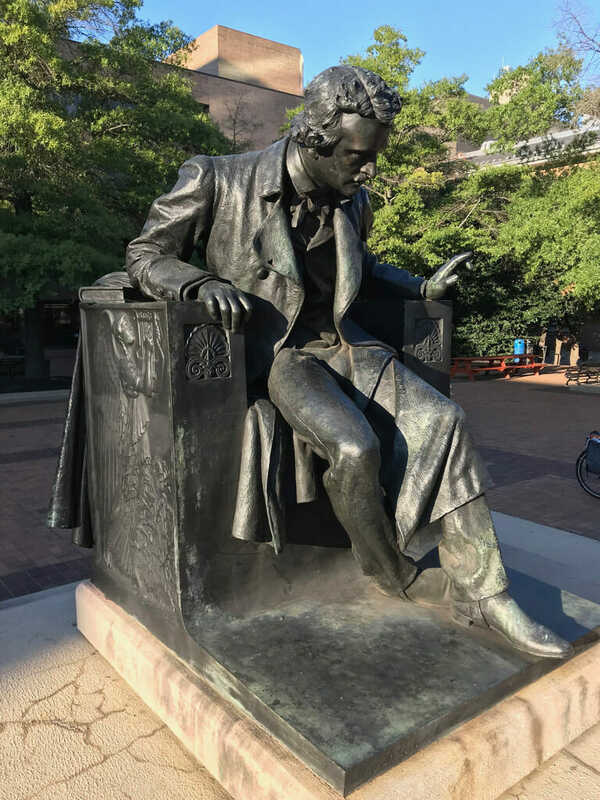 Arriving in 1921 from Rome, this highly popular Edgar Allan Poe Statue features Poe sitting in a classical chair admiring the various muses of music and poetry carved around him. The statue was originally placed in Wyman Park, though a lack of upkeep led it to be moved more recently to the University of Baltimore Law School, where it serves as a sort of impromptu school mascot. More commonly referred to as 'The Horse', this historic saloon is rumored to have been a popular Poe drinking spot, more specifically the last spot Poe was seen in Charm City before he wound up at the hospital. There is even a 'Poe's Last Stop' sign hanging up, though there is no evidence that this is true. There are also rumors of various haunts late at night in the colonial era building (1775), the barkeeps claiming to leave out a glass of whiskey to appease Poe's ghost every now and then. Apropoe's is a Harbor East dining location (Marriot) that serves up comfort food, local favorites, and Baltimore history-themed eats!! 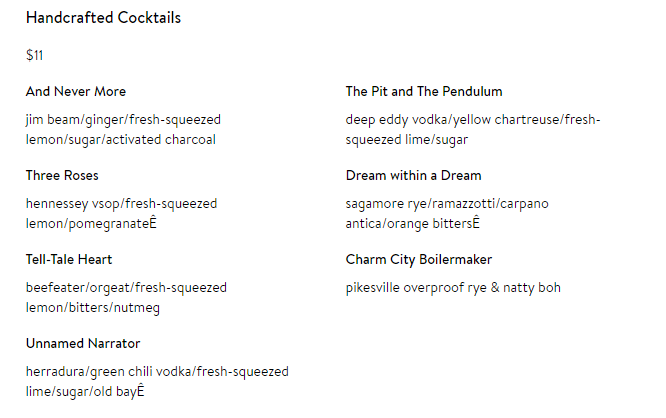 The waterfront setting is spectacular, as are the crab cakes, award-winning butter chicken with shallots and toasted almond raita, and Poe themed drink menu! 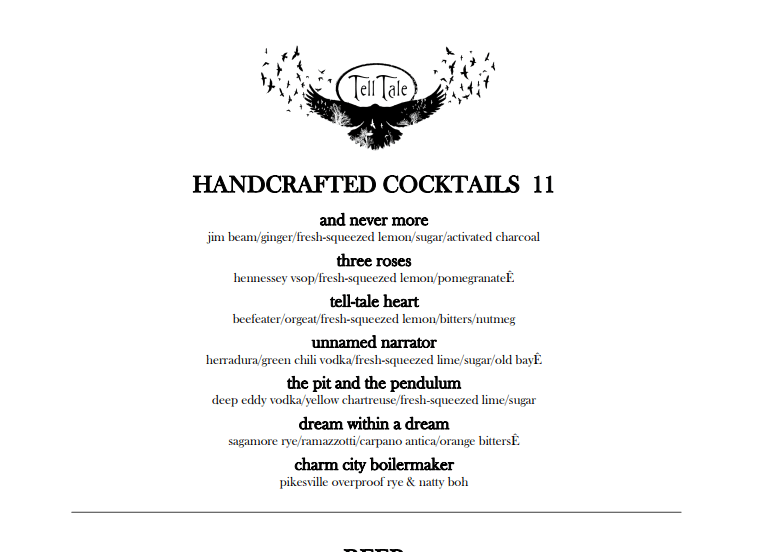 The TellTale Restaurant is another Marriot dining destination, only this one is in the Inner Harbor. Again, the crab cakes and local history are to die for here, as are the pulled pork tacos and fresh flavors from the rooftop herb garden. Take a cruise on the Raven yacht and learn all about the harbor, history of the city and those who lived in it (of course, including Poe), and the port and it's importance in general. 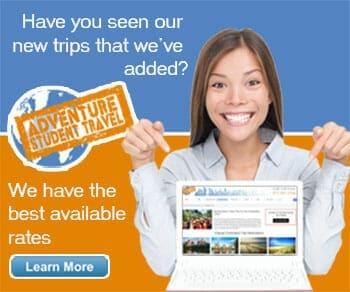 The cruise is just about 2.5 hours long and trust us, the crew has many tales to tell during your experience! The M&T Bank Stadium may not seem like an obvious place to stop to pay tribute to Edgar Allan Poe, but it most certainly is. M&T Stadium serves as the proud home to the Baltimore Ravens NFL team, and the Baltimore Ravens' name was inspired by Poe's most famous poem! Take in an exciting home game if you can, or tour the home of the Ravens during the day! If you happen to be visiting in the fall you may just happen to make it to Poe Fest, a 2-day festival full of books, art, music, and live performances all dedicated to the legend himself. There are various vendors, booksellers, and specialty food trucks all throughout the festival grounds, as well as special events such as the Death Weekend Bus Tour or Black Cat Ball aboard the Steamship Yacht.